Just one week ago, I had a brainwave & my 20 Days of Gold Making challenge was born. Since then, I've had loads of comments & a few emails about it & I've been pleasantly surprised by just how many bloggers have decided to join in. I thought it would be nice to have a central list of everyone who's joined in so far so here it is! Phat - Phat Lewts Gold Blog - If you haven't read Phat's blog, go & read it now! He has a great written style & really knows his AH stuff. Dacheng - The Dacheng Diaries / Casual Noob - This is a new blog to me, not very AH focused but I enjoy Dacheng's written 'voice' so I'll be heading back regularly! Ross - The Feckless Leader - another newish blog & new to me too. Ross has written a great pet leveling guide if you have 1 or 2 high level pets already. I see my next addiction on the horizon! Larry - WTB Skill - Another newish blog, from a PvP'ers perspective but Larry has just joined our goldmaking community so I look forward to a very different viewpoint. PvP is a complete mystery to me! Shaft - Shafts Words - Another blog that is new to me, Shaft has joined the challenge & I look forward to hearing more stories from him too. Gimp - Gimps Gold - A fellow Brit, Gimp drags me through suicide runs (sorry, I mean dungeon runs!) & makes it look so easy! He knows his AH stuff too & is a regular guest host on Power Word Gold podcast. Faid - Clockwork Riot - blogger, youtuber & another regular guest host on Power Word Gold podcast, Faid is very knowledgeable & has a totally different style of AH'ing than I do. Farli - The Overcut - Farli is kinda famous for his transmog gold making but he writes about other AH stuff too. He's been afk a little while but he's back now, yay!!!! Jojo - Admiring Azeroth - a fairly recent addition to my non-gold blogs list but one I read regularly anyway. Jojo describes herself as a noob gold maker so I look forward to reading her answers. Soco - Vault Of Light - a fellow Brit, fellow gold maker & now on my server too, she writes a variety of stuff but competing with her on the AH is great fun too, she knows her stuff, that's for sure! Jim - Power Word:Gold - blogger, streamer, podcaster & all around busy guy, Jim hosts the Gold Blog Directory on his site too. Evlyxx - Evangelysm - totally new to me but Evlyxx has been around a while & has decided to join in this fun challenge too - welcome to the madhouse! Xsinthis - The Golden Crusade - Author of the Annual WoW Wealth Survey, Eric has been around a while now & always has a fresh outlook & usually detailed analysis of stuff too. Selltacular - Copper to Gold - a brand new blog with Day 1 as his first post! I look forward to reading lots more from him as his Day 1 post has lots of history & I'm nosy to hear more! 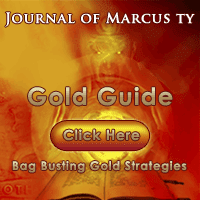 Marcus Ty - Gold Blog of Marcus Ty - author of a great Gold Guide (see righthand sidebar for link :P), he has some great articles on his blog. I love his twitter tips too, would definitely recommend a follow there! Droth - Droth's Treasure Troves of Gold - a brand new blog, kickstarting off with the 20 Days of Gold Making! He's been making gold since Wrath but only just started blogging so pop over & say Hi! Wow! what a list hey? Some regular, well known gold blogs in there & it's great to see new gold blogs as well as more general WoW blogs joining in. If you've joined in & I haven't added you to this list, please tweet me (@nevahaddict) or leave a comment here & I'll make sure to add you too. I do hope you are enjoying reading the answers to my questions - sometimes it's nice to reminisce on old times & just chat about stuff rather than teaching/analysing etc. There are lessons in these stories too which is just an added bonus as far as I can see & finding so many new (to me) blogs is the icing on my cake! And probably a few others too. I've really enjoyed reading everyones responses so have decided to participate myself. Just posted Day 1. It's no problem :) Thank you for adding me to the list! And once again, thank you for giving me what I needed to get started. Living Steel - Still Profitable?